Etgar Keret is an Israeli writer who has had his work translated into thirty-seven languages. He is a lecturer at a university and a short story writer. 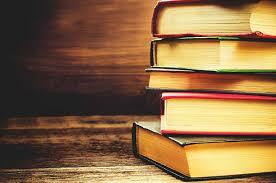 Keret has also appeared in many newspaper publications and reviews and contributes on This American Life. I was first introduced to Keret through his short stories and the work that he has done on two films, Jellyfish and Wristcutters: A Love Story. 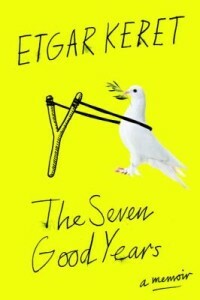 The Seven Good Years: A Memoir chronicles in a year-to-year story the seven years between the birth of Etgar’s son and the death of his father. Each section is broken up into a different year and while Etgar does manage to incorporate flashbacks to help readers realize how he became the person he is today, how he met the people important to him, and how his relationships with his family have grown and changed, the majority of the story is on pivotal moments that happened within those seven years of grandpa, dad, and son relationships. Lev, Etgar’s son, was born in the middle of a terrorist attack. When they finally get to the hospital, there are no doctors in the maternity ward because there are so many trauma people needing help. The journalist who goes to interview Etgar makes this attack seem commonplace and Etgar soon references Tel Aviv. Readers are thrust into a Keret’s world, a world where he travels the world doing book talks, meets with different people, and does readings from his previous works. The flashbacks provided me with much needed background to understand the reluctance and focus on family behavior through certain circumstances. Although Lev and Etgar experienced their childhood at different time periods, the overarching base emotions prove to be the same. I found this book by Keret to be an engaging and emotional read, one that while being marketed as a memoir, also read to me as a story about more than just his family life. Sure, on the surface the family dynamics are there, but I found myself digging deeper into the book to really flesh out the happenings that molded Etgar and his family to behave the way they do. I found this book to be an introduction to a culture and an area of the world that I basically grew up knowing little to nothing about. This memoir could have been exceptionally heavy and depressing, in fact at points it is, but Keret was able to show readers that while sad moments are present, there are always ways to find good moments as well.